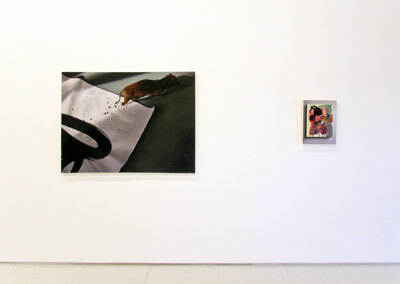 IMAGE ABOVE: From left: Raychael Stine’s Big Pink Pickle, 2012; Blue and Pink Yow, 2012; and Bertilde, (After Jean-Auguste-Dominique Ingres. French, 1780-1867; Amédée-David, The Comte de Pastoret, 1823-26), 2013. Courtesy of the artist and Art Palace. Raychael Stine’s paintings How to fall down in the grass, 2013, and Tricky Yow 2, 2013. Photo courtesy of the artist and Art Palace. Resistance can and does take many forms. For artist Raychael Stine, it often takes the shape of a dachshund—an unconventional surrogate of sorts that helps her defend the value of sentimentality in the context of contemporary art, as well as the importance of emotion in everyday life. This month in Houston, Art Palace presents a little ways away from everywhere, a powerhouse exhibition of Stine’s exquisitely painted, defiant imagery, including portraits of her beloved dog, Pickle. Being human also means facing difficult things such as loss and death. Pickle died in December 2012. Raychael Stine, Moons for Moons, 2012. Digital photograph, acrylic paint, black bond, postcard, triangle canvas, wooden shelf, weasel pelts, women’s spittoon, white daisy mums. 6′ x 6′ x 10″. Courtesy of the artist and Art Palace. For Stine, painting is always going to be about everything painting can be, and most people can appreciate her major artistic pursuits: How is it possible to make visible—literally to picture—experiences, memories, and the passing of time? So being a dog lover, or even someone who is “in touch with their feelings,” is not a prerequisite for appreciating and engaging with her artwork (trust me). 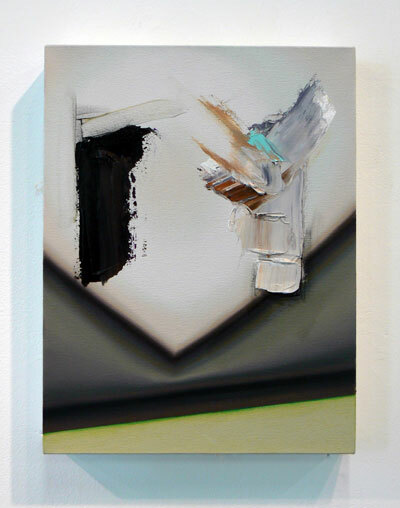 The universal themes of looking and questioning are enticing because of Stine’s ability to visually translate the general appeal of her personal commitment to specific things: paint and its possibilities as material and image, the physical intimate experience of looking at and making paintings, relationships that are based on an exchange between looking and touching. 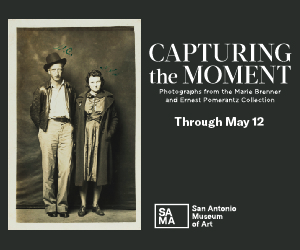 Although each of her works in a little ways away from everywhere is inviting on its own terms, a truly memorable and rewarding art experience is the result of the subtle yet visibly intriguing relationships amongst all the paintings in the exhibition. 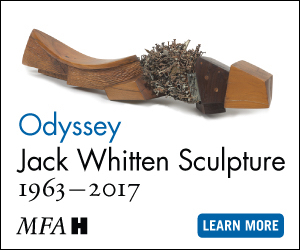 For example, Pickle is recognizable in the work titled How to fall down in the grass; with a little time and attention visitors may notice a similar painterly investigation of light, color, and shadow in Sneakers, Vision 3 or even Heaven’s Bones. Conceptually, we might imagine that Black Shuck is an interpretive “ground up” perspective, from under Pickle’s body in How to fall down in the grass. 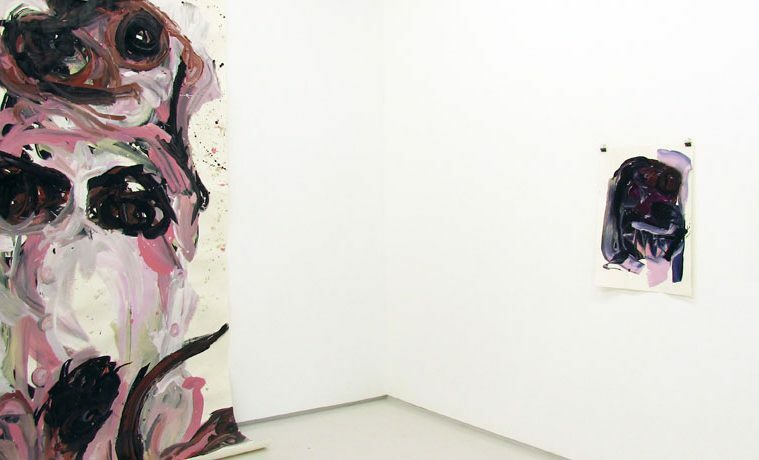 Further, Big Pink Pickle and Black Shuck share formal characteristics such as physical orientation of the subject and the broad, black brush strokes, but each painting employs its own representational tactics to play with the physical and perceptual space of the picture plane. Raychael Stine, Vision 3, 2013. Oil and acrylic on canvas. 17″ x 13″ Courtesy of the artist and Art Palace. Additionally, Stine uses color, scale and proximity to indicate a relationship between time, space and subject matter. For example, Vision 9 hints at a direct correlation between the larger painted canvas hanging on the wall and the smaller painting propped ever so precariously above it. Stine invites viewers to look inside, outside, behind, and around her artworks. By encouraging us to imagine what “mysterious space” lies behind a painting, she also challenges us to consider the relationship between representation and translation, and helps us to recognize painting as both an object and an action. 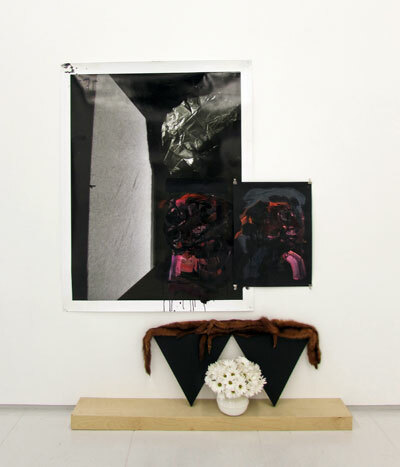 She provides opportunities for this with three-dimensional entry points, as in the layering of painted and photographed images in Untitled; in the still-life-like arrangement of photographs, animal fur, flowers and other objects in Moon for Moons, both on and off the gallery wall; and with imaginative compositional illusions in such works as Tricky Yow and Tricky Yow 2. Through her paintings, and specifically with the exhibition a little ways away from everywhere, Stine plays out her interest in and dedication to the ‘thing’ of painting—what it is to re-construct, not de-construct, an experience. She also demonstrates her flair for facing the facts of life head on.